"Fantasy is a necessary ingredient in living," said Dr. Seuss. "It's a way of looking at life through the wrong end of a telescope." The realm of fantasy is a space for us to imagine possibilities that seem beyond our reach. The bridge that connects the seemingly impossible with the possible is the greatest gift of our species: creativity. Together with Shutterstock , we're exploring those possibilities by rallying the community to share fantasies and ideas for what it means to live #InACreativeWorld. The theme was chosen by our Lima chapter, presented globally by Shutterstock, and illustrated by Hayden Davis. This month with Shutterstock and in 157 cities around the world, we will delve into what it means to live #InACreativeWorld and how we can use creativity for the good of all. The most intriguing responses will then become illustrations that get featured here. Anthea Moys Why wouldn't you want to come and play? Emily Belden What's Your Fanta-ta-sy? Gerardo Shulman El viaje como escuela de vida. Johannes Ippen A Fantastic Journey Through Experience Design or: How to be Irresistible. "A coisa mais importante que você ganha é imunidade para lamentar"
"A gente conserta o mundo criando ponte entre as pessoas." "Quando a gente se dedica a alguma coisa, um palito de fósforo que seja, a coisa te devolve." "Quando acontece alguma coisa ruim para você é porque vocês está apto a resolvê-la"
"Aqui na frente desse teatro Passa todo o tipo de gente Passa o burro e fica inteligente Passa o doente e fica são Passa o honesto, e às vezes passa o ladrão E a todos eles eu dedico Um dedinho da minha atenção"
"Onzimo mandamento: suportai-vos uns aos outros." "Sabe quando a gente cai do cavalo na vida? Quando a gente acredita 51% nos outros e 49% na gente." "Não queira ser bravo quando basta ser inteligente"
"Quando não tem remédio, tem que resolver na terapia"
"Não me tire o que você não pode me dar"
"Tá ruim? Mexa que o açúcar está no fundo"
"Na vida o negócio não é a lente, é a armação, a vida é uma armação"
"Fui aí que descobri, cada fulano tem de sobra o teatro que merece"
"Isso aqui não é eleição Nem campanha eleitoral É só um modo de ação Para lhe mostrar que trabalho para o bem de nossa nação Sou candidato a nada Sou artista da pá virada Tô fora da procissão Seu voto quero não Só lhe peço camarada Um dedinho de atenção"
"Sabe o que salva a humanidade? As ideias. Sabe o que afunda a humanidade? As ideias." "Uma salva de palmas para quem cumpre a sua missão"
"Fui dar uma caminhada Por sorte achei no chão Uma caixinha jogada Guardei ela no coração 45 palitos Em média lata de um dia De tanto emprestar para os outros Acabou sozinha e vazia Acendeu tanta vela na vida Clareou tanto apagão Ajudou a fazer a comida Cumprindo a sua missão"
"A gente sempre dá chances para os novos valores"
"O corpo tem que participar"
"A gente enfeita tanto o espírito que tem uma hora que ele vaza para o lado de fora"
"Se você tem convicção, põe ela para o lado de fora, é aí que está a fantasia"
"Curitiba é uma cidade experimental, ela é tão experimental que até o cu vem na frente... deve ser por isso que todo mundo gosta de meter o pau nela"
"Quando você tem o cabelo assim você pode falar o que você quiser, as pessoas não te levam a sério"
As far as I’m concerned, before that happened, that was fantasy for me. But it did actually happen so it was reality even though it was improbable but it wasn’t impossible. Fantasy.. is the activity of imagining something that’s highly improbable or impossible, yet nothing is impossible. Keep checking in with what you want to be when you grow up. Random things happen, if you just do things, let things go and put things out there. Are we willing to share our platforms in order to give creatives a stronger voice? Nearly every success I've achieved has been a result of listening to someone who was willing to share their experience. Our creation has the power to unify or divide. You define your reality by the others, by how you see them, and by how they see you. It [the fantasy] gives you the opportunity to escape. We have many speeches and not conversations, because to have conversations you have to be vulnerable. When you talk about fantasy, the chance you have of creating absolutely anything is 100% valid. Waking up and living is making text every day. If you've been somebody in your past life, it's very humbling. I always consider the audience as one of the biggest pieces in creating a production. Because we can do all that work and all that preparation and create this whole thing that we can put on the stage, but if nobody comes to see it, then it really has no impact. Once you step on that stage you really are in a whole another world and it really takes something to do that, to throw your head over the wall and jump off that cliff and to make yourself that vulnerable, but it's absolutely exhilarating and when it does happen, you are not only creating the fantasy, you actually become it. When you think you are at full capacity, remember that you are actually just full of capacity. J.R.R. Tolkien said that Fantasy is the "back door to your heart." Your willing to explore ideas that may not be safe. There is a very scary political climate right now, but if we start discussing the dark lord Sauron and how he took over Middle Earth, we can actually have a safe conversation in a mirror world. 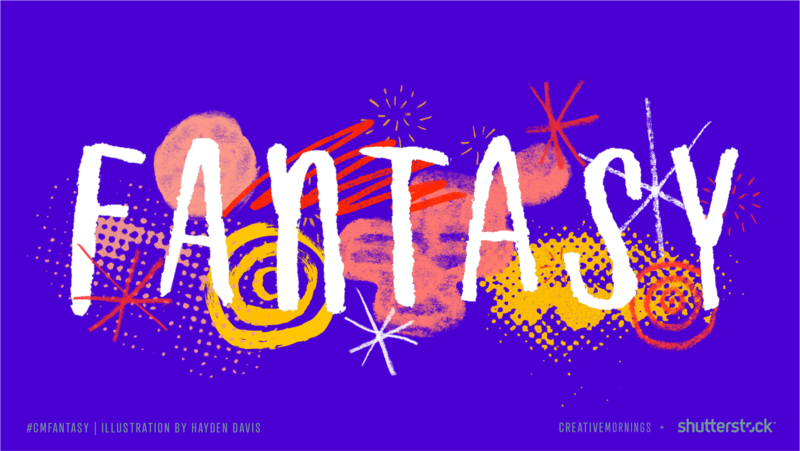 Fantasy is another place we can go where we can explore ideas, where we can explore feelings, where we can explore things that may not be safe in our world. Fantasy isn't really for children, because they don't need it...Fantasy is really for us for whom the blade is really dulled and need to be reminded that this world is magical. Homer used artistic license very openly in The Iliad. Even questioned his entire culture. That's what Fantasy does - it reminds us of how magical the world that we live in is. Greek mythology...is a soap opera. What's the point of Fantasy? Ultimately it's about the question: "What does the fact that we are going to die, no matter how strong we are, have to do with how we live life?" The amount of money, effort, man-hours that went into Batman Vs Superman - to put Gilgamesh on tablet, it was a similar endeavor. Fantasy has been something that has existed in humanity for all time, almost unchanged. What are the fundamentals of your craft? And how can you give yourself class to hone them each day? Ballet is essentially a craft of meticulous, consistent, constant physical conditioning. It started with one human being, LOVE LOVE LOVE. Stirring the pot. There is a power greater than all the world's leaders combined that is still in charge of this universe. What are mistakes anyway? We all make them right? Some might argue, that its one way of learning how to not do something. But it can also be an invitation to other possibilities. The first step is to think big, imagine, dream, have a vision! With all these limitations, what could I possibly do? Get out there and start creating, and try stuff, and find people who want to get into the space and fail and move on and imagine. The whole point of being a storyteller or a creator is to effect change or to create an emotion or build feeling in people, and there’s no better way to do that than through virtual reality. Dreams without action is just a distraction. I have dance parties by myself often. Fantasy knows when to play the hits. We need things that last through the evening. And that you think about tomorrow and that you have nightmares about tonight. Fantasy needs a concept... If you're just selling widgets, stop. We need no more products. We need concepts. Sometimes you gotta twist the prompt to make it fit your fantasy work. One person's fantasy is another person's god awful noise. Dreams require hard work, persistence, determination, and strategy. Are we the creatives willing to fight for our dream? Creative power allows us to think beyond perceived limits. Our out-of-the-box reality gives people the safety and freedom to simply be. Giving people access to art empowers them to alter their own thinking. Altered thinking leads to lasting change. Our stories can not be limited to the space in our museums. We can become street curators taking art places where no museums exist. Our financial investments through memberships and donations to cultural institutions demonstrating a commitment to an exclusive voice become a powerful weapon for confronting racism, sexism, misogyny, homophobia, and xenophobia. When leaders of established cultural institutions fail to adjust their systems to provide access to everyone, it is our responsibility to disrupt the system. Our dream is to create cultural institutions that are as diverse inside as the world outside. A homogeneous world is a fantasy. Nature is diversity. And creatives are the purveyors of culture. Are we willing to share our platforms to give other creatives a strong voice? My fantasy for all creatives is to claim our rightful place at the table, and if the table isn't open then we create our own. Our art is as essential to life as food, shelter, and clothing. Creatives are the ones able to think of new things and make new ways. We challenge ideas and expand minds, and our creation is the power to unify our divide. If impossible is potential, then fantasy becomes a dream. And a dream is an attainable goal that requires hard work, persistence, determination, and strategy. For many, it's a life-long quest to have a seat at the table. And instead of us receiving an invitation to join, we hear a determined voice that there is no room. Out there is where all the great ideas are—giving other people the chance to give input. Being able to discover what makes you happy is a very important thing. Most of my life changing moments were routed in a fantasy world. Fun experiences will speak to you like human beings. November 18 Rendirse esta prohibido, Alberto Reynoso. November 30 Fantaseo, luego existo.